Background: A platinum- based doublets with a third- generation agents /Gemcitabine, Vinorelbine/ represent the standard first- line treatment for advanced patients with non- small- cell lung cancer /NSCLC/ and good performance status. Aim: The aim of this study was to evaluate the two commonly used newer platinum- based regimes in response rate and survival. Methods: In the period 2005- 2007 ninety- four inoperable patients with NSCLC entered the study. The treatment schedule consist of Gemcitabine 1250 mg/m2 day 1 and 8 and cis- Platinum 80 mg/m2 with hydratation day 1- 46 patients /arm GP/ and Vinorelbine 30 mg/m2 day 1 and 8 and cis- Platinum 80 mg/m2 with hydratation day 1- 48 patients /arm VP/, every 21 days. Results: Overall response rate was 39% for GP and 32% for VP. Median survival was 10,3 and 9,8 months respectively. Neutropenia was significantly higher in arm VP as was thrombocytopenia on the GP arm. Conclusions: That data suggest that both regimes remain reasonable choices for patients with advanced NSCLC with slight prevalence of GP. Key words: Gemcitabine, Vinorelbine, Non- small- cell lung cancer, Response rate, Survival. 2. Non-small cell lung cancer collaborative group. Chemotherapy in non-small cell lung cancer: A meta-analysis using updated data on individual patients from 52 randomized clinical trials. 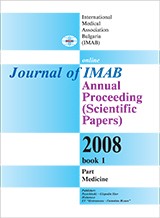 BMJ 1995; 311: 899–909. 3. Bunn PA. Chemotherapy for advanced non-small-cell lung cancer: who, what, when, why? J Clin Oncol 2002; 20: 23s–33s. 4. Ranson M, Davidson N, Nicolson M et al. Randomized trial of paclitaxel plus supportive care versus supportive care for patients with advanced non-small-cell lung cancer. J Natl Cancer Inst 2000; 92: 1074–1080.